The concept of this story is directly tied into the subject discussed in the previous “Once Upon a Time #3” in that I am dealing here with “genealogy”, family history, memory…the preservation of the past. Going back to one’s roots to explore the treasure trove of story found there. “preservation,” which might be labeled ‘basic essential’ for writers. So I had this old world grandmother, called “Babi” in Czech…who never spoke English, who ‘forced’ me to learn a spattering of the old language as a child, since I was often left alone in her care. Much of this I captured in a story previously mentioned, “Skarda.” But now I wanted to explore ‘time’ even before then. I wanted and needed to inhabit and imagine a whole different world. She was long gone by the time I wrote this story. Oh, there was enough family around to inquire a little of this, a little of that. But I needed another realm of the unconscious entirely. I needed the magic, the rhythm, the language, the violence, the form, the fantasy, the morality, the romance, the indestructibility of the fairy or folk tale. I needed the Brothers Grimm. And so I spent months with them (including a whole summer here in Door County, borrowing books from the Ephraim Library, years before I moved here) and in the end (the beginning) wrote “The Old Woman’s Preserves”, which was originally published in December Magazine, reprinted a number of times, and the opening, anchor story in my first collection of short stories, THE HOUR OF THE SUNSHINE NOW, published by Story Press in 1978. Once upon a time not so very long ago there was an old woman who saved everything—bits of string, rusty nails, seeds, fruits, vegetables—in case a time should come when there would be nothing. All the days of her life were spent working the earth of the old land, finding and pre­serving food for her family which was poor. Winters were long and there was never enough to eat. One day the husband, who never did anything but smoke a pipe and sit in the shade of green apple trees drinking his wine, told the old woman and their three sons—the last of which was dumb—of the stories he had been hearing in the village. Men spoke of a new land across the sea where oranges and cabbages grew heavy from the earth, where rivers and lakes danced in the sun, where mountains shoul­dered their way above trees and clouds, and where, above all, men made something of themselves and built great cities of stone in spite of mountains and rivers, cabbages and clouds. But the old woman did not care to go. For her there was only the earth of the old land to be worked for whatever it would give so that her men would not go hungry. The land was poor and the harvest would never be rich, but there was enough to live, to preserve. For the husband she could occasionally butcher a wild pig or wring the necks of chickens with her bare hands. For the three sons there were new cab­bages, apples, beans, and always jars of another summer’s preserves. But the husband grew more restless and one day said, “Come, we will go!” And the old woman, who did not care to leave, made ready to go. For nine days and nine nights the old woman cooked and stalked the countryside for vegetables and fruits to preserve. She feared the journey by sea and the new land ahead. She stored more and more food, afraid that her men might go hungry. When her own land was bare, but for weeds, earth, and flowers, she begged cabbages and cucumbers from other women nearby. And when people at last turned her away, she sneaked off in the night and stole fruit with the light of the white moon, filling her apron with all that looked heavy, ready, and ripe. The husband and sons grew more anxious. On the stove, pots bubbled and sang and clouded the air while the old woman fed sticks to the fire and stirred and stirred with a wooden spoon. The table was covered with jars and crocks of all shapes waiting to be filled. 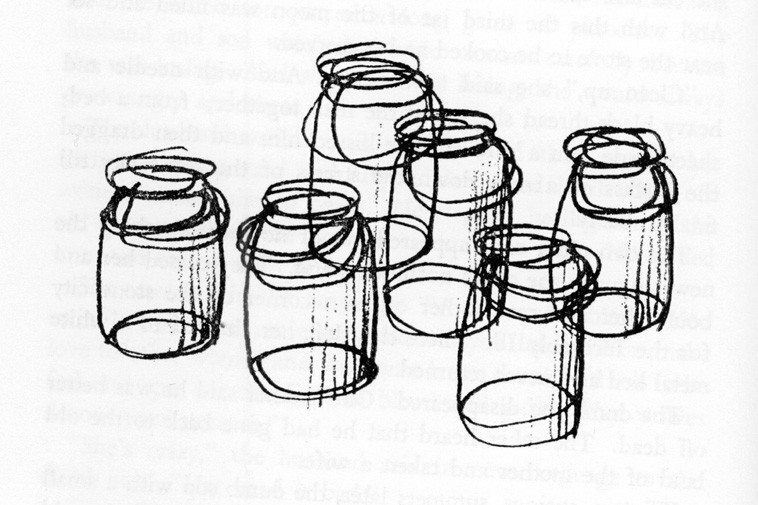 Nine days and nine nights she cooked and stuffed jars with preserves. First beans, then peas, cabbages, carrots and beets. Then stolen berries for jam—black, blue, and red. Tomatoes. Apples. And hard, sour cherries. Then on the ninth night they came with sticks. “Bring me more wood,” she said. “For the fire, it is going dead.” The husband grabbed the wooden spoon and beat the old woman on top of the head. That night, when the fire died and the iron stove grew blue and cold, the old woman sneaked from the house with only three empty jars that remained to be filled and sat by a creek and cried to the moon. She was sorry to leave. Afraid of the new land ahead. Cities built of stone! What could the people be? How could there be oranges, cabbages and clouds? Or room enough, land enough, sun and fire enough, to cook and preserve? Cities of stone! What happened to earth—trees, flowers, cows, dung and dogs? And what of the sun? And, you, the moon? Still the three jars remained empty as she knelt and begged help from the moon. Was there nothing else to save for the journey, the winters, the stone cities ahead? The moon spread its light and understood her need. “A new land is new food,” it said. ‘Fill the second jar with the magic of the food you make. The dumplings, the sauerkraut, the ‘tripe soup, and rye bread.” And this the old woman happily did and also poured in some red wine. “A new land is new work,” it said. ‘Fill the third jar with all the tools and toys of your wrinkled hands. Needles and thimbles, buttons and thread, scissors to cut and mend old clothes. Soft down for your pillows. White thread to crochet; colored strands to embroider. Yellowed dice for your game of bunco, and the worn cards of the pinochle deck. A paisley babushka, an amber comb, a red poppy to wear in your hair.” And this the old woman happily did, and also shoved in an old bread knife. Then the old woman who did not care to go—went. They sailed a winter through the sea with two hundred others just like them. Two hundred others packed tight, buried deep in the bottom of the ship. A winter of tossing, of ice, of waves one hundred trees high. Of sickness, disease, death. But also of birth, of song, of concertina music, and jars of good food. The beans, the peas, the cabbages, the carrots and beets were all slowly emptied, and the jars tossed into the sea. The old woman fed her men and others who were hungry and had nothing to eat. She nursed the sick. Taught children new songs. Brought new children to life. Pierced the ears of young maidens. And made shrouds for the dead. They sailed a whole white winter through the sea; then met the new land in gray rain. The city was swollen with stone just as everyone said. Some stared from the ship in wonder. Others held back and were afraid. But the old woman moved first and led her family into the city of stone. She walked street after street of rock, looking always for some earth, a piece of sun, a green place to live, grow food, and preserve. Did the stone never end? Finally the husband ordered a halt, “Stop! Here under­neath this brown building of stone is room enough for us to live.” And the three tired sons were glad. But the old woman was fearful as she climbed down to the cold darkness of their new home. Spring and summer passed unnoticed since the stone build­ings remained always the same. Trees said nothing, because there were none. Flowers and birds never came. There was heat, much heat like summer, but seldom the sight of sun. In time the old man set out to make his fortune, finding hard work deep in the city of stone. The two older sons each in short time ventured out, leaving the old woman alone with ‘the youngest who was dumb. Her men brought money when they returned and taught the old woman how it worked; how much of it so much could buy. Slowly she learned the feel of it in her hands and began to make her way outside, from under the building of stone. She made but one path: to a small building that sold food. Once each day she came out with the new money clutched in her fist; bent toward the stone pavement, picking up match sticks, torn paper, and broken glass. In paisley babushka, apron, and under arm a burlap shopping bag, she crouched through the stone city to the small building that sold food. Her own preserves were soon gone, and the new food was hardly worth saving. Besides, it was not her food; had nothing to do with her hands. Soft cabbages and pale toma­toes! Best to eat quickly and not look. The family ate its meals in silence. When the old woman talked, the husband and sons swore at her because she did not try to use the new language. “You’re in a new land now! Learn the new lan­guage!” And the three of them would slowly bring out the new language, voice the new words, try them on each other, laugh a little, and each day learn more. To the old woman it was like slowly going deaf. At night she would eat from the first jar of the moon, curse the men, make music to her­self, and sleep with stories of the old land. Never once did she try the new language, even utter a single word. She be­came dumb like the youngest son. Each day she cooked and cooked and cooked, but the food was never right. Hours she spent at the stove using all the magic that was left in the second jar of the moon. Soon the husband seldom came home for supper. The sons began to leave. The first found a woman of the new land and moved to another city of stone. The second learned the new language so well that he forgot father and mother and brother com­pletely; made his way speaking the new language with the new people high up in a building of stone. The last, in his strange silence, stayed home and watched the old man and old woman slowly dying. Watched as the old woman worked and worked the new food, trying hard to bring back the taste of the old. Watched with both eyes in .the night as she cooked and cooked at the stove, crazily shaking an empty jar (the second jar of the moon) into every dancing pot. One night, after much wine, the old woman, the husband, and the dumb son played a long game of pinochle. The husband and son watched the old woman carefully because she was losing. And when she was losing, she would always grow angry and cheat. The husband waited and watched and then caught her with the wrong card and slapped her hand hard. The old woman cursed him to death. He slapped her again till the old woman hurled the deck of cards in his face. He leaned over and swung a fist at her head. The dumb son watched with eyes afire. When he lay dead in blood upon the floor, she called for a soft pillow to be placed beneath his head. And this the dumb son did. Then he stood at her side and watched as she held the empty third jar of the moon and sliced from the mouth of the father a tongue, and dropped it in. Next worked the knife around the holes in his chest, reached in and pulled out a red heart. This too was placed in the third jar of the moon. Then with knife and two hands soaked in blood she cut and she cut and she cut till she tore from his middle a stomach. And with this the third jar of the moon was filled and set near the stove to be cooked and preserved. “Clean up,” she said to the son. And with needle and heavy black thread she sewed the man together; from a bed-sheet made him a shroud. She kissed him and then dragged the carcass of a man down the streets of the stone city till finally she fell. The two older sons appeared out of nowhere speaking the new language she could not understand. They cursed her and bound her and carried her off to a corner of the stone city for the Incurably Ill. There they left her chained to a white metal bed and never returned. The dumb son disappeared. One brother said he was better off dead. The other heard that he had gone back to the old land of the mother and taken a wife. Winters, springs, summers later, the dumb son with a small boy returned to the city of stone and searched for the old woman—his mother. And found her at last in the stone house for the mad. She was gray and thin and chained to a white metal bed. A silky black whisker grew from a mole on her chin. Her mouth was shrunken but moving. Orange soda in a white paper cup lay untouched on a table beside her. When the third son and the boy approached, she held her mouth still. “Mother, I bring you rye bread, Jars of beets, cabbages, and berries,” seemed to say in their language of old. “And where is the knife?” she said. The dumb son balanced the small boy on her stomach and put the tiny hand to her face. Gently the old woman rocked her body and hummed a song to the child while the dumb son began cutting the bread. They talked, but no one heard. They loved, but no one saw. They ate until their stomachs were full. And the mouth of the man who last told this is still warm. My Blei blog printout library overfloweth. Grimm and gritty! A midwinter tale if there ever was one. Had she ground him up for sausage, she might not have gone to the madhouse. Is the moral: In the land of madness the mute survive? Or: Be careful what dreams you store in bottles? Or: In the land of madness, join the crowd? Won’t forget this one soon!! I remember this amazing story. 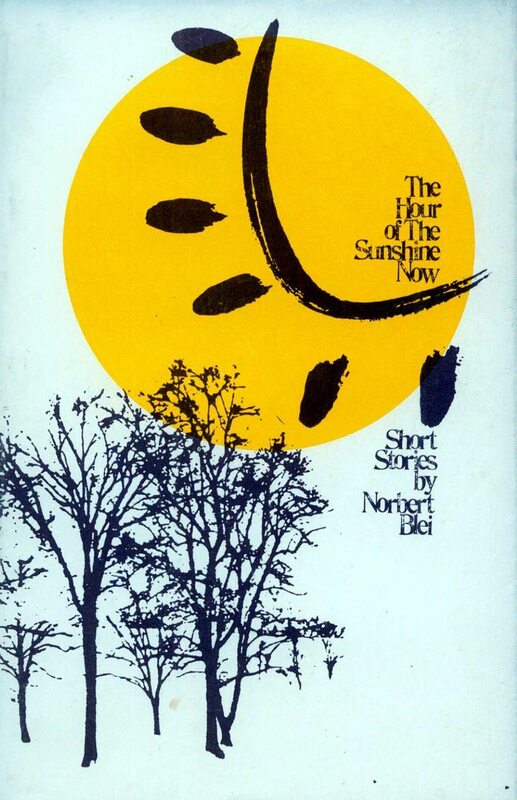 I remember The Hour of the Sunshine Now – my first Blei experience. Folk tales…so much said, so simply. Something to ponder. I had read this story before, but did not remember it well. I found that out only as I reread it, my first reaction was “What a beautiful story! How beautifully articulated this tale of the grandmothers of many of us…and then, ah then, the stone city part came with all its horror. I knew then why I had chosen not to remember it. For all the mastery of the way it is told, it is an unbearable story, a story that leaves scars on the heart.